Most people I know consider their lives to be blessed. I was reading an article in a magazine sent to me by my sister-in-law (who is a Christian Scientist) about gratitude, and it set me to thinking about how many times I hear people saying, “I’m blessed.” I watch the evening news only to stay abreast of the economy, the weather, or for other educational purposes, but I often tune out the bad reports because I hear words of ingratitude and “unblessedness” grumbling in my ear. This isn’t a Polly Pureheart stance–I just get tired of hearing commentators grousing about the crumbling state of the world. Even when I served as director of Solomon House and saw hundreds of needy people weekly, many of them left me with the words, “I’m blessed.” The phrase wasn’t and isn’t confined to any class of people, and I hear it repeated more often than I hear phrases of ingratitude. C.S. Lewis once described his mentor, the Scottish minister and writer George McDonald, as a man who was “hospitable as only the poor can be.” That statement has always resonated with me because I’ve often been the guest of such hospitality. I’ve also seen impoverished people give beyond their means, and when I ponder this thing called gratitude, I honestly don’t know many people who aren’t grateful–who don’t either volunteer time to good causes or open their checkbook to some charitable endeavor. I encounter giving people more frequently than I do miserly or ungrateful people. Recently, I read that volunteerism is burgeoning, that charitable giving is still strong, and the exception to all of this are the corrupt who have been toppled from their perches of power on Wall Street. I repeat, most people I encounter and know are grateful people. Every Thanksgiving, I especially remember my godmother Dora and her husband Markham who contributed so much to my life and to the lives of my offspring. I wrote a tribute to Dora in the introduction to my book, THEIR ADVENTUROUS WILL, and Markham appears in many of my blogs and poems. When my oldest child was born, Dora entered my life in a cogent way when she re-introduced me to Anglicanism – true Anglicanism–the tradition of "a lively, changing body of thought," as Urban T. Holmes says, that embraces comprehensive thinking and invites all to come to the table. She was dismayed that I had fallen away from the church, so she began to send packages of books published in the old Church Teaching series, books by the mystic Evelyn Underhill, and by her mentor, C.S. Lewis. She also wrote long letters with a line that she repeated often about people losing everything except God and finally realizing that He had been with them all along. That was the essential blessing that my godparents gave to me–an intellectual nudge and their heartfelt wish for me to develop my spiritual life because, as Dora said in an inscription in one of Evelyn Underhill’s books, “we wish for you the fruits of the spirit above all else – for then, all riches will be yours.” In later years, these godparents made my life more comfortable materially, and I remember them daily for that assist, knowing that I’m blessed. However, the initial gift was one which Dora called (in the words of Evelyn Underhill) the “Radiance of Reality” or the inspiration to pursue the spiritual life. Even though she died before I entered the process to become an ordained deacon, she was probably the greatest influence on my decision to answer this call. I’ve been blessed by the influence of good and grateful people. If you google Dora Greenlaw Peacock, you’ll read about her contribution of a cookbook library to the Virginia Polytechnic Institute where Markham was head of the Dept. of English and Foreign Languages for many years. 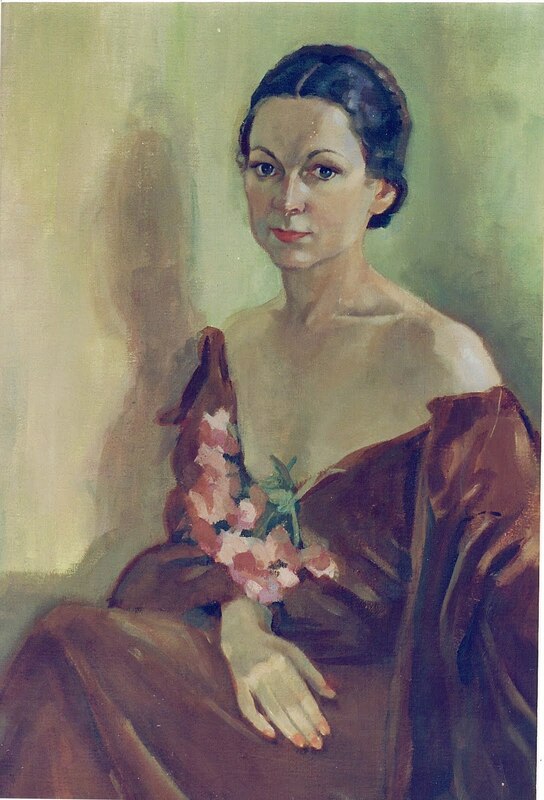 The portrait of Dora, shown above, was painted during the 40’s. We’ve made enough trips to Mexico for me to appreciate Mexican artisans and their colorful pottery, and I was especially impressed by the pottery work of Oaxacans when we vacationed in Oaxaca City about six years ago. Since then, I’ve passed displays of pottery and chimeneas in Texas and New Mexico that have caused me to covet one of the earth-toned chimeneas for my patio. Friday evening, I finally decided that I just had to have one, so we set out for Wal-Mart’s to look for a front-loading fireplace and found a small one that we felt would brighten up a patio devoid of anything except a bereft looking St. Francis statue. Right away, we learned that if we purchased one, we needn’t expect to be able to transport this big-bellied oven to the car. Even so, the brawny Wal-Mart worker had to use a wagon to carry it, and my neighbor was enlisted to help us unload the piece and place it on the patio without dropping it on its stomach. Just as we prepared to fire it up with pinion wood (to ward off the ubiquitous mosquitoes that hover around my patio), Janet, my neighbor, informed us that “Downtown Alive” had been cancelled because of storm clouds. Her forecast held, and as we unwrapped the package of wood (yes, you can buy firewood in Wal-Mart), rain began to fall. Ever wonder how you prevent rain from pouring down the chimenea’s chimney and flooding its stomach? If you have been through a Louisiana hurricane, you know that blue tarp will cover anything, including leaky roofs, so we unfurled blue tarp and shrouded the chimenea for two days. Yesterday afternoon, we folded up the blue tarp and brought out the wood. Now, I’m a former Girl Scout executive, and Victoria has camped in every campground in the U.S., but we must have had a senior hour before we remembered to use kindling to get the fire started. We burned up an outdated copy of Episcopal Diocese of Western Louisiana canons (a lot of pages to keep us wayward clergy in line), a cardboard box, and we even tried to set fire to a damp pine cone before figuring out that we needed to strip kindling from the pinion wood. Voila, we had a fire going by 3:30 p.m.! We sat and looked at the fire, basking in the glow of the flames, and reminisced about fires we have known – including my memories of ovens in Iran that were used to make the wonderful nahn we often bought at the bazaar and ate with homemade chili. I’ve since learned a lot about chimeneas, including the fact that Mediterranean food tastes better when cooked over a wood burning fire, but instructions that came with the chimenea warned me that this big-bellied oven sitting on my patio can’t be used for cooking. Chimeneas originated in Mexico, of course, and were primarily made of clay and terracotta, but today you can buy elaborate ones made from cast iron. On a windy, chilly day in San Diego, California, I enjoyed an outdoor meal near a cast iron chimenea, and I’ve eaten in other restaurants where they’re used for cooking and for creating a cozy ambience. I’m told that my chimenea may not have a long life span due to its tendency to crack because of the difference in expansion between the inside of the chimenea and the outside surface temperatures. I’ve been advised not to move the chimenea around very much as it likes a stable environment and fractures easily. It also prefers gardens and enjoys the faces of flowers, rather than blank walls. (You can plant plants as close as six inches away from your chimenea. As for maximum warmth and coziness, two-four people can stay comfortably warm by sitting two-four feet away from the chimenea. Articles about chimeneas warn that wet climates like Louisiana may cause cracking, flaking of glaze, and crumbling clay, so I guess I’d better get the most use from this open fire garden heater before I meander back to Sewanee, TN in the Spring. 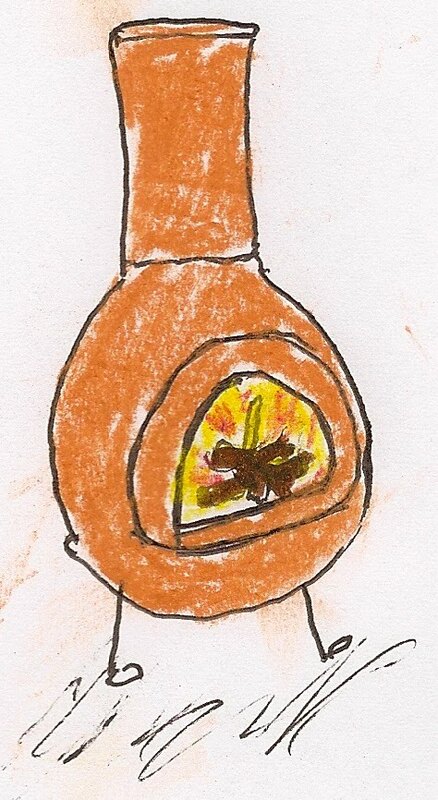 I’m thinking of having a chimenea party on one of those gray days in winter to share the aromatic scent and radiant blaze of this wonderful oven. When I was in central Florida recently, I spent some time with a small boy named Alex who is a member of the Sullivan clan, a very clever two-year old who walked with me several times on the lake property belonging to Inez Sullivan. We chased butterflies and squirrels, gathered shells near the lakeshore, mocked crow calls, and picked up moss that had fallen from the oaks surrounding the property. My biggest success with entertaining Alex occurred when we decided to put the moss he had collected around faces that had been attached to two oaks along the driveway – eyes, nose, and mouth made of a clay-like material that adhered to the trees and which looked like the faces of old men. After we decorated the trees, Alex was so enchanted with the results, he wanted to go back after dark and re-do the old men’s faces. 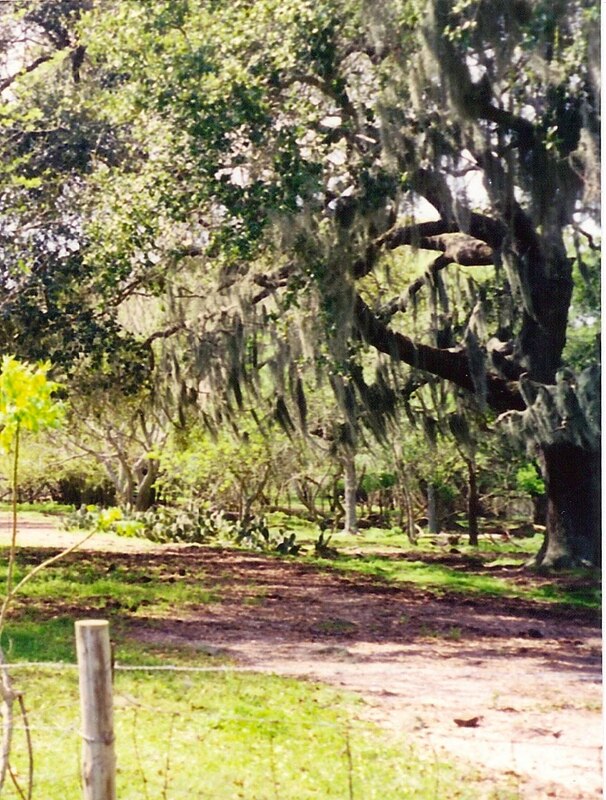 The moss Alex and I used to create beards and hair on the old men’s faces is the same Spanish moss that trails from the ancient oaks here in Teche country. I can remember being impressed by the gray beards trailing from drooping branches of oaks on my first visit to this area. 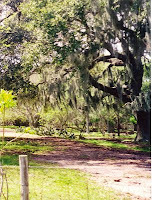 Spanish moss, which is gray-green in color, is an epiphyte related to the pineapple family and thrives on air and the extreme moisture prevalent in Cajun Country. Moss provided an industry for Acadian families before the advent of foam rubber and other synthetic materials and was used to fill mattresses, upholstery, automobile seats; it was almost indestructible as filler for those products. According to Case, families who gathered moss were usually large in number and children helped with the operation. The family also had to possess a small barge with a ladder on it, and the barge was pulled to a location where moss grew abundantly. Children picked the low-hanging moss, while the father used a long pole with a hook on the end to pick strands of the fiber from the tall oaks. When the family had filled the barge, they went home, spread the moss out on the banks of a bayou, and wet it down with water. The constant wetting process caused the outer fuzzy covering to rot and exposed a black resilient fiber that never rotted. Approximately six weeks later, pickers washed the moss and hung it on fences or trees so that it could dry. The fuzzy covering had rotted quickly in humid Louisiana weather. Then the moss was washed in water until it was a glistening black color. Again pickers dried it on bushes, trees, and fences. Later, it was made into hundred pound bales and transported to buyers. Case wrote that if a family was energetic enough, they could initiate an assembly line process with black moss drying on the fence, green moss curing on the banks of a bayou, and the moss picker in the woods gathering more moss from the trees. She added that if the family was really enterprising, the father of the family could put out trot lines in the bayou to catch fish to trade for coffee, sugar, and other products needed. Mattresses in Cajun Country were often made with the resilient moss, and some old-timers claim that they lasted a lifetime. In large families, several moss mattresses were placed on beds, and when company arrived, one of the moss mattresses would be taken from the bed and placed on the floor for visiting children. Case reports that now and then a moss picker would be lucky enough to come upon a tree that had been felled by a Louisiana storm or would find treetops from the previous year’s float. The moss on these trees had been in the water for months and would be well cured by the time the moss picker discovered it. The picker then bypassed curing the moss, which was a process that slowed down readying the moss for marketing. I don’t know if Floridians were as resourceful as Acadians who used the abundant Spanish moss on their trees for making mattresses, but Alex, a city boy who lives in Columbus, Ohio, passed a good time using strands of it to create hair and beards for the old men faces on the oak trees surrounding Silver Lake. He and I got plenty of “something for nothing,” moss picking to satisfy our play impulses. Well, here it is again – another book about to be born. On my return from Florida yesterday, I found the proof of OLD RIDGES, the 23rd book I’ve written. It’s a compilation of new poetry and short stories written throughout the last 45 years. In a few weeks, the book will appear on Amazon.com, and I’ll move on to other projects; namely, the revision of two mysteries that have been collecting dust in a box for at least twenty years. The title, OLD RIDGES, seems to resonate with a lot of my readers, perhaps because many of my friends are in their sixth and seventh decades, and the reference to old ridges suggests aging. Some of the short stories include childhood experiences, such as “He Was Too Smart” and “The Book of 100 Stories;” others are satirical, especially a tongue-in-cheek one about the chaos in my church, the Episcopal Church of America. Then there are several stories about Iran and a really outré short story about a cane toad. The thirty poems in this volume were written during my sojourn at Sewanee this year, a few of which appeared in previous blogs and two reflections/prose poems; one about a librarian friend, now deceased, and another about my godfather’s father who lived in the Mississippi Delta. “You can’t check out books from the Adult Section.” Miss Riggs peered over the top of her black-rimmed glasses at Sarah, and her hand clamped down on the book Sarah had selected to take home. Miss Riggs’ blonde hair sprang up in violent corkscrews on her head and seemed to be the only alive part about her. “A rule is a rule. If we relax one, soon all the children will be in the Adult Section, reading things their minds can’t fathom.” Miss Riggs reddened to the roots of her disheveled hair. 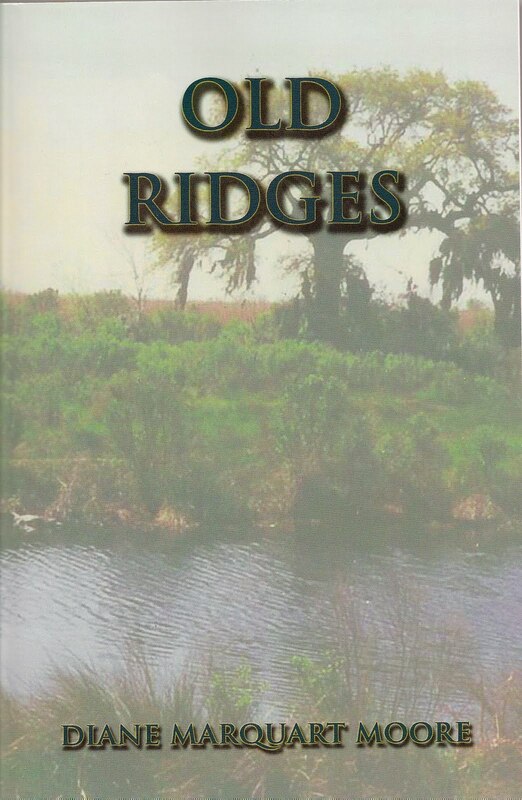 OLD RIDGES will be available on Amazon.com in two weeks. 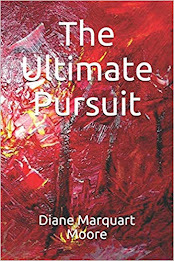 See my other books at http://borderpressbooks.com. A few years ago, I put an idea on the drawing board for a novel about Last Island, or Isle Derniere, once a small island on the coast of the Gulf of Mexico, located about 100 miles from New Orleans. However, after reading the masterful account, CHITA, by Lafcadio Hearn, I discarded the idea. Last Island was once a resort community before being completely destroyed by a hurricane in 1856, and Hearn published his novel about the hurricane and its survivors in 1889. In 1980, Louisiana author James Sothern published a non-fiction account of the hurricane and the devastation of the island in a book simply entitled LAST ISLAND, but I hadn’t read any other accounts until I walked into Books Along the Teche in New Iberia recently and found two books about Last Island displayed on the checkout counter. The one I bought is entitled ISLAND IN A STORM by Abby Sallenger, and I think that it deserves the Louisiana Book of the Year award. Author Sallenger has a B.A. in Geology and a PhD. In Marine Science and is a former chief scientist of the U.S. Geological Survey’s Center for Coastal Geology. He combines history and environmental facts in an account that is compelling reading. I found ISLAND IN A STORM to be a page turner, and it certainly convinced me that I didn’t need to write a book about Last Island. I have little to add to the story of that disaster and certainly know nothing about the case he presents about environmental concerns. Following the hurricane that hit the island and by the end of the summer of 1856, Isle Derniere, which had been a two-hundred-yard wide strip of sand on its Gulf side, fringed by marsh on its bay side, became totally uninhabited, devoid of homes and hotel, except for a forest standing in the surf. Trees had been reduced, and the island had been broken in half. According to Sallenger, between the 1890’s and 1988, Isle Derniere retreated landward about two-thirds of a mile and lost three quarters of its surface area. The tragedy of Isle Derniere is twofold: loss of human life and coastal erosion. At one time, the island boasted an exclusive summer resort that attracted wealthy planters and merchants; it was a place where they escaped the dreaded yellow fever epidemics that occurred during humid Louisiana summers in New Orleans and other Louisiana cities. Four hundred inhabitants were on the island when the hurricane struck without warning. The island was known for unrivaled fishing and sea bathing, and many of the summer visitors stayed at the Last Island Hotel where they could enjoy a bar, billiard and bowling saloons, and a livery stable. The beaches of hard-packed sand provided good walking and buggy riding terrain, and “The Table” was supplied with choice delicacies, including fresh catches from the Gulf, for the palates of the wealthy. Sallenger’s account of an island storm also serves as a warning tale about global warming and the vulnerability of coastal locations. He relates how storms have a continuously-eroding impact on low-lying areas along the Gulf Coast. It’s interesting to note that he reports Last Island has never been rebuilt, whereas Dauphin Island, hit by hurricanes in 1979, 1985, 1998, and 2005, has been rebuilt four times in 29 years. Holly Beach, which was wiped out during Hurricane Audrey in 1957, damaged by hurricane Carla in 1961 and every structure destroyed in 2005, then was inundated in 2008, has been rebuilt again and again. Despite sediment starvation and sea level rises, humans doggedly rebuild structures on the sandy coasts of the Gulf…except for Last Island, which, ironically, lives up to its name. This is a brief review of ISLAND IN A STORM, and for those who like a good read about historical events, the prose is elegant and fast-moving. Abby Sallenger tells a more than 150 year old story brilliantly. Not only does he spin a good historical tale, he inspires some deep thinking about the future of our fragile coastline. A Postscript to ISLAND IN A STORM: My old friend, James Wyche, Jr.(now deceased) of Belmont Plantation, once replied to a column I wrote about Last Island with a “Post 1856 Narrative of Last Island,” in which he told the story of his father and a friend, Tom Henderson, making a trip to Last Island in the early 1890’s. It seems the young men had been crossed in love and decided to get away from “it all” and return to a “primal state,” as Jimmy described the experience. They chartered a lugger in Morgan City and were left on Last Island with a few possessions, minimal provisions, a barrel of drinking water, and a tent. They told the boatman to return in a month to pick them up! In the meantime, they planned to live on fish, crabs, oysters, primarily seafood. “Papa said some of the oysters had shells almost the size of soup plates,” Jimmy wrote. To catch fish, Jimmy’s father and his companion waded into the shallow inlets to lagoons and seized fish with their bare hands. About the time their transportation disappeared, they discovered their drinking water had been placed in an empty, untreated, and uncharred whiskey barrel and was unfit for human consumption. The men discovered rain water had soaked through the sand until it reached the level of the greater density sea water underlay and rode on top of it. By making a hole in the sand, the men found fresh water, uncontaminated by salt. The water had the taste of some plant and carried an unusual flavor, but they drank it. Although Jimmy’s father and Tom Henderson had been lifelong friends, they grew tired of each other on this deserted island, and they’d take walks, one to the east and the other to the west, to keep the relationship intact. Jimmy ends this island saga with a story about the men varying their table fare with a pelican. They shot one, prepared the meat from it in steak form, and roasted the steaks over an open fire. However, when the food had cooked, the odor was so overwhelming, they “abandoned their project,” as Jimmy reported. In 1930, Jimmy’s father took him to Last Island, and he was able to see the exact spot of the island idyll. One of the joys of coming home to Teche country is that of returning to an artist’s paradise. Years ago, I wrote that New Iberia bred more artists and writers per square foot than any place in the U.S. Perhaps it’s the lush scenery that provides an artistic backdrop, or perhaps it’s the diverse blend of people from European backgrounds that inspires the proliferation of art, but whatever inspires it, I’m a fan of all the artists in the region and try to visit the New Iberia Artwalk when I spend the winter here. Friday evening, I attended the Artwalk that featured art work in metal, wood, paintings, pottery, jewelry, and furniture, starting with A&E Gallery on W. St. Peter Street, which features the work of 20 New Iberia artists. I was blown away by the latest work of my favorite New Iberia artist, Paul Schexnayder. Paul has done covers for several of my Young Adult books, and I love his whimsical studies that are rendered in bright blue, red, green, and yellow acrylics. His latest paintings of New Iberia scenes are as busy and colorful as his past work, and when I look at them, I feel as though I am participating in a festival or some kind of celebration of Cajun life. It’s hard for me to believe that Paul is color blind, but he is. I once wrote that his folk art is definitely “color bold.” His paintings tell stories that make connections between the people and landscape of south Louisiana. Paul attended LSU and graduated with a B.F.A., and he relates that his work began in Graphic Design but after preparing and presenting a portfolio to his professors, he was told he should be taking the Art curriculum. After he entered Art, he was told he should be in Graphic Design, so he explains his style as somewhere between those two. After graduation, Paul began painting contemporary Louisiana folk art while living in Boston. Once he began working in this genre, he knew he had to return to New Iberia and paint the scenes and people of his roots. In Boston, he also taught art to dyslexic children enrolled in the Landmark School. His subjects range from a band of angels flying over the Bayou Teche keeping watch over the bayou city that inspired him to return home, to a life of Christ narrative he wrote and illustrated for his wife, Lee. He makes handmade wooden and metal crosses, having been inspired by Spanish crosses he collected while honeymooning in Santa Fe. On each cross, he includes a house painted on its surface. Many of his paintings are on pieces of wood and slate. I have always liked the panel of “Away With Their Whole Lives Before Them,” a painting on wood, 34 x 48, featuring a yellow-haired woman (his wife Lee) and a reddish-haired man (Paul). The woman is dressed in a lavender gown, and her arm encircles the black-cloaked man if she means to clasp him forever. The couple is guarded by a pair of white doves in a tree, and viewers know that it depicts Paul and Lee beginning their married lives. Sometimes Paul paints fish outlined in red to portray the catch of south Louisiana waters: redfish. The panel is supported by a row of piano keys painted beneath a red piano cover bearing hand prints. Paul has exhibited his work all over the world, including Paris. Stateside, he has had exhibits in New Orleans, Houston, Texas, Massachusetts, and in other galleries and museums. Paul once told me that he gets excited thinking about the fact that when people buy his art, it’s going to become part of their family history and will be there for generations to enjoy. I have bought many of his prints and given them to relatives and friends for gifts, but I possess only one depiction of an old house on a small piece of slate that hangs in my Sewanee house. However, I’ll always have the covers he painted for my Young Adult books, and “Hay la bas,” I pass a good time looking at them! Since my exodus from Sewanee, Tennessee for the winter and my return to New Iberia, Louisiana, I’ve done a lot of culling of files and books, which I mentioned in a previous blog. Yesterday, I discovered several articles and a research index card about a woman I considered including in my profiles of memorable Louisiana women for THEIR ADVENTUROUS WILL back in the 1980’s. Her name is Caroline Durieux, an artist (now deceased) whose satirical art became famous during the 30’s and 40’s. Most of her lithographs are included in a volume entitled CAROLINE DURIEUX; LITHOGRAPHS OF THE THIRTIES AND FORTIES by Richard Cox. Durieux attended Sophie Newcomb in New Orleans in 1913 and later went to the Philadelphia Academy of Art where she was influenced by the work of Daumier and Chinese landscape painters. She married Pierre Durieux, a New Orleans exporter who took her to Cuba and then to Mexico City. The famous artist Diego Rivera painted a portrait of Durieux and is said to have praised her work because “It’s not like mine.” Durieux’s societal renderings sometimes impinge on dark satire, but they’re very amusing. She also did lithographs of serious subjects during WWII, the most famous one being “Persuasion,” in which a huge hand is shown gathering up a crowd of hapless people, denoting the oppression and fear associated with war. Durieux’s work has appeared in the Smithsonian, the National Gallery of Art, the Museum of Modern Art, New York Public Library, and in many other state museums. She was a highly successful artist and enjoyed the benefits of being born into a wealthy family and marrying a wealthy exporter, but her life was marred by tragedy when her husband committed suicide. She taught art at LSU for 21 years and continued to make her prints available to the public at affordable costs during her lifetime because she claimed she never had to create art to make a living. I had requested an interview with Durieux when she was in the Ollie Steele Burden Manor in Baton Rouge but couldn’t get through to her by telephone to schedule an appointment, so she didn’t make the cut for my book on Louisiana women. However, through the years I’ve enjoyed checking out library books of her lithographs. With reference to my former blog about “quirky,” Caroline Durieux’s work could be regarded as “quirky.” I think she’s a highly original artist, even if her most caustic works ridiculed women. Since I don’t have rights to reproduce any of her lithographs for this blog, I can only direct you to google her name on the Net. You’ll enjoy the unique lithographs by this Louisiana artist. P.S. The index card above shows my intent to publish a profile about Durieux. Perhaps some of the art critics who write for “Louisiana Cultural Vistas” (the magazine published by the Louisiana Endowment for the Humanities) will write an extensive biography about this unusual woman. Yesterday, I received a rejection message from a major publisher concerning a manuscript that a good friend and I jointly authored. The message included some favorable, positive remarks, followed by a description of the manuscript as “quirky.” Now, I’m quirky about that word “quirky,” since it was once used to describe a serious book I had published about Louisiana Women entitled THEIR ADVENTUROUS WILL. Well, the word does mean “peculiar” – but then, “peculiar” can mean “distinctive” – and “distinctive” can mean “distinguishing.” Therefore, I conclude that the manuscript is “distinguished.” There --is that reductive reasoning, or what?! My co-author friend, who knows of my aversion to “quirky” told me about a very intelligent man who calls himself “Canon Quirk” and insists that this man is a prophet. So, again, using reductive reasoning, we’re in the company of prophets, right? I’m happy that the manuscript was read and actually well-received, so I can’t quack about the quirky remark. Perhaps I’d have felt more comfortable with the word “quark,” which has its derivation in a word that means to caw or croak. And since my favorite birds, the handsome crows, caw, why shouldn’t our manuscript quark? Three quarks for the novel that elicited an evaluation of “quirky.” Well, you say, enough with the quarking about quirking, and just yesterday you had no qualms about telling poets to burn all rejection messages from publishers. I’m saying to you today: Don’t question that advice; people often quibble about silly things, and I sometimes use quodlibetic language when I’m trying to quash my reactions to a word that doesn’t qualify as the most quintessential remark to make about a manuscript. In another quarter, a publisher says her editors are “queueing up” (her words, not mine) to read the manuscript, and I’m hoping she doesn’t say it’s quixotic. O.K., I’m quitting while I’m ahead on the “q’s” in this questionable essay. And don’t quote me as saying anything quirky. I’m drowning in the quicksand of “q.” Shall we move on to the letter “r”???!!! November and a little nip in the air signals me that Thanksgiving is approaching. I don’t know the temps in Sewanee, Tennessee right now, but I think we timed our homecoming to New Iberia, Louisiana to coincide with the onslaught of winter on The Mountain. The leaves in the woods near our cottage at Sewanee had become beautiful red, yellow, and orange hues and had fallen in our yard and surrounding woods when we locked the cottage doors, turned off the water, and drained lines in preparation for what old-timers on The Mountain predict is going to be a cold winter. We’re still green here in Louisiana! As we’re invited to my grandson Martin’s new home for Thanksgiving, I don’t have to ponder menus and polish silver this year, but I still like to read about Thanksgiving spreads. One of the most unusual Thanksgiving dinners I’ve read about took place in the Ft. Juniper, Massachusetts home of poet Robert Francis. 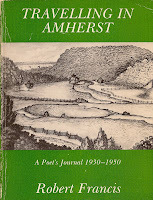 He wrote about it in a little book entitled TRAVELING IN AMHERST, a journal of the years 1930-50 in the poet’s life. I‘m on my fifth reading of this small volume that chronicles not only his everyday experiences in the Massachusetts countryside but his philosophy/theology of life. In this book, we see his reaction to a neighbor perched in an apple tree, his wisdom as he considers the inevitability of change, and his feelings about writing poetry. We’re also treated to some of his best poetry. Note: For all you wannabe poets out there, Francis burned 459 rejection slips he had received for his poetry submissions, had a 16-year hiatus between publishing several books, and self-published two of his volumes of poetry. However, he received the Shelley Memorial Prize, Golden Rose of the New England Poetry Club, was Phi Beta Kappa poet at Tufts in 1955 and at Harvard in 1960. In addition he lived in Rome on a fellowship from the American Academy of Arts and Letters and returned to Italy on an Amy Lowell Travel Scholarship. In 1974 he received the Brandeis Creative Arts Award and became a Fellow of the Academy of American Poets. If you’re a poet who keeps old rejection slips, find a good place to make a bonfire and burn them. Create space for more writing and better fortune! Don’t be daunted by publishers. Read a raunchy poet like Charles Bukowski alongside Robert Francis, and you’ll probably decide, as I did, that contemporary critiquing is more a matter of taste than a matter of recognizing good talent.